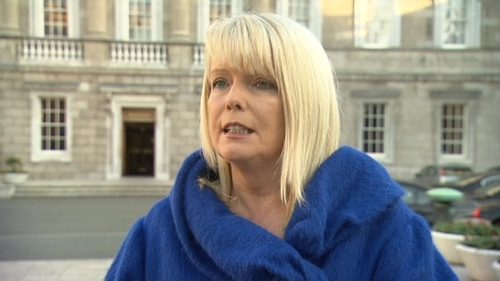 The Union of Students in Ireland has said it "cautiously" welcomes a statement from the Minister of State for Higher Education, Mary Mitchell O’Connor, that the issue of student loans is "off the table" for the lifetime of the current Government. The union says the Minister of State made the comment while speaking to protesting DCU students outside Leinster House last week. This evening Ms Mitchell O’Connor has confirmed that that is her view. According to the USI, Ms Mitchell O’Connor said no plan exists inside her department for the introduction of a student loan scheme "for the near future". In a statement this evening the Minister of state said she wished to reiterate the Taoiseach’s previous comments that the Government could not stand over an outcome that left Irish students graduating with the kind of debts that American or English students do. When asked about Ms Mitchell O’Connor’s assertion that student loans were "off the table", a spokesperson for the Department of Education said the department had agreed to undertake an economic analysis of different funding options for third level including that of a student loan system. The spokesperson said that while this work is underway, student loans would not be introduced. The introduction of higher student fees coupled with a deferred payment loan system was one of several options put forward in a Government commissioned report by Peter Cassells on funding for the sector. The universities favour such a move as a way of addressing the third level funding shortfall. However, the Institutes of Technology oppose it. They say such a move would deter students from poorer backgrounds who are more likely to be debt averse.